Mallavray’s Magnificent Manual of Magical Marvels – Released! The City in the Shadow of the Stolen Moon is a sprawling metropolis choked with the smog and industrial waste from reckless magical manufacturing. Grim horrors stir in the caves and sewers beneath the city as the uncontrolled waste awakens unnatural creatures. It is in this deep darkness that unlikely heroes find themselves, heroes that will find dangerous and unknown life, brave toxic environments and climb their way through the filth and muck of the mechanized sewer to the bright and searing freedom of the desert above. Blood & Grease is an adventure module designed for four 1st-level characters, written for the Pathfinder Roleplaying Game and compatible with the 3.5 edition of the world’s oldest RPG. Blood & Grease takes place in the City in the Shadow of the Stolen Moon in the Weeping Worlds campaign setting. This module is part 1 of the Sandscorned adventure path. 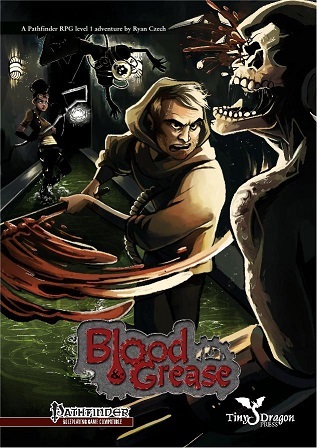 Blood & Grease is available now on Drivethrurpg.com!